“What will the world be like when the youngest of the Beeson grads are in the prime of your ministries?” asked The Rt. Rev. 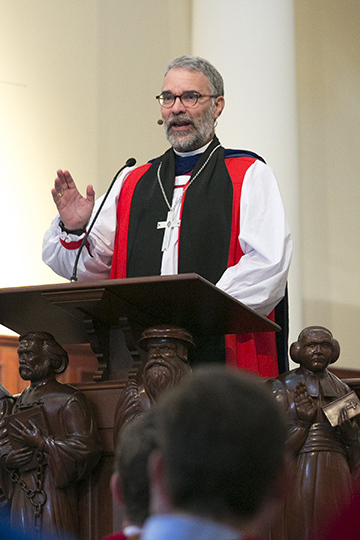 Dr. George Sumner, Bishop of the Diocese of Dallas, Texas, during Samford University’s Beeson Divinity School commencement and service of consecration May 9. The answer Sumner said the world needs is “distinctively Christian,” that is, human beings are made in the image of God, have sinned against God, and are redeemed by faith in Jesus Christ. Earlier in the service, Samford President Andrew Westmoreland welcomed the graduates and guests to the beginning of the 175th anniversary year of Samford University. In so doing, he reminded the graduates that they are part of a great cloud of witnesses to the gospel of Jesus Christ of those who have graduated from Samford University before them. “To the graduates this morning, we salute you on this milestone in your journey, and as you receive the degree that you so dearly earned, we send you into the world as Samford’s only legacy that will last unto eternity,” he said. In his opening remarks, Timothy George, Beeson Divinity School dean, gave special recognition to faculty member Patricia Outlaw, who retires at the end of May after 15 years as associate professor of pastoral counseling. Seven students graduated with a Master of Arts in Theological Studies, 22 students graduated with a Master of Divinity degree, and one student graduated with a Doctor of Ministry. The ceremony was one of seven commencements scheduled this spring at Samford.